although it can venture out to new places, too. You'll know it when you see it. Cruise past Chamisal Vineyards on Orcutt Road in Edna Valley, then hang your next right. Turn down the unassuming dirt driveway and prepare to be dazzled. 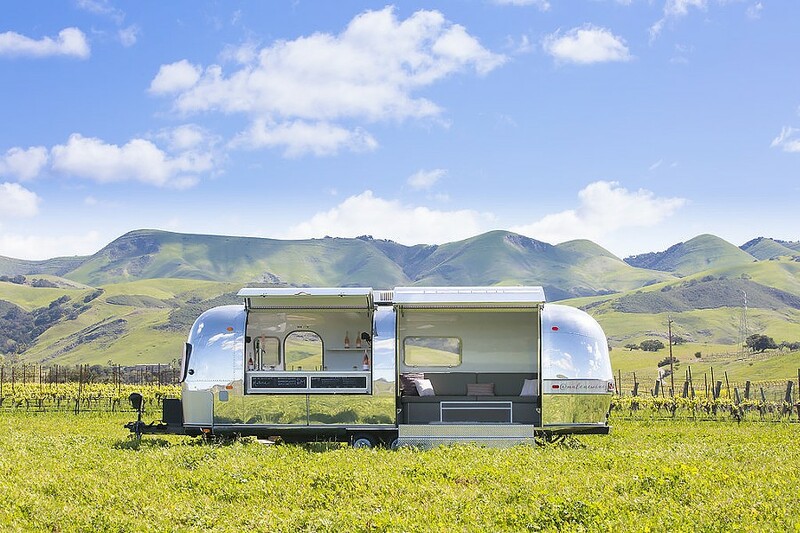 ROSÉ-COLORED GLASSES Just in time for summer, Malene Wines is throwing open the doors of its 1969 Malene Scene Airstream Overlander trailer and inviting one and all to taste elegant and modern rosé releases. Roomier than it looks, this wine tasting room on wheels is large enough to accommodate a tasting bar and cozy enough for good conversation to flow between about a dozen people. You can't miss it. Smooth metallic curves catch the Central Coast sun, causing you to reach for your trusty Ray-Bans. It is a flashy and unexpected sight surrounded by manicured green lawn, native plants, and lush vines. Yes, I am speaking of the classic 1969 Airstream trailer that summer dreams are made of. Is it a mirage? Some psychedelic oasis? No, you have not been transported into some groovy Palm Springs postcard. You've just hit the Malene Scene, and yes, that's the name of the trailer (vintage trailer enthusiasts know any good specimen should have its own name, color scheme, and backstory). A sister winery to Chamisal Vineyards, the Malene Wines trailer is a fully equipped mobile tasting room. She is road-ready and willing to wander, yet will live mostly in this corner of scenic Edna Valley, sticking out like the Tin Man's sore thumb. As you may have already gathered, this isn't your family's old silver bullet rusting in the backyard. The Malene Scene—customized specifically for mobile enjoyment of rosé—is a swanky experience, a place where faux fur collides with rose gold corkscrews. Fitted with a state-of-the-art wine tap, it may truly be the first of its kind in California. The Malene label rosé wines served here are as pink and plush as you'd expect; yet the flavors are more fresh, modern; and acid driven than the classic rosé you may be used to. 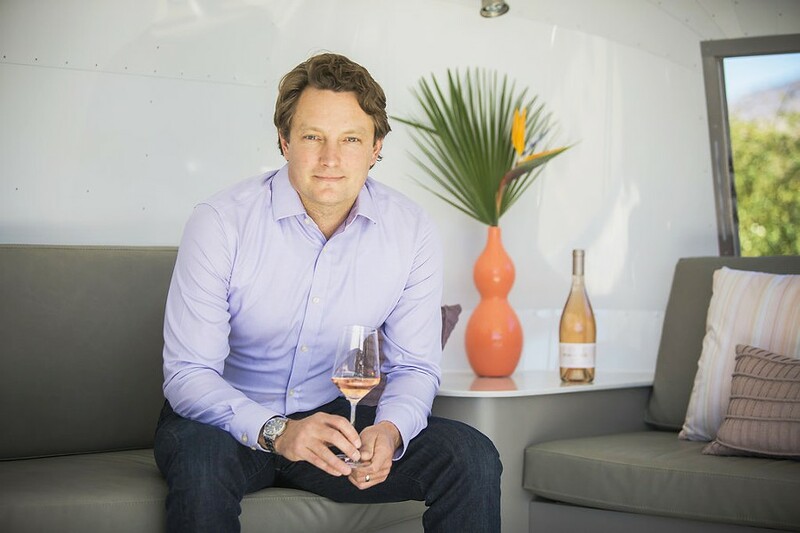 MAN IN PINK Chamisal Vineyards and Malene Wines Winemaker and General Manager Winemaker Fintan "Fin" du Fresne has thrown a modern, Californian twist on the classic rosés of Provence, France. He is also the owner of the new business Winery Mechanical Systems, which aims to service SLO County's wine industry with mechanical repairs and maintenance. 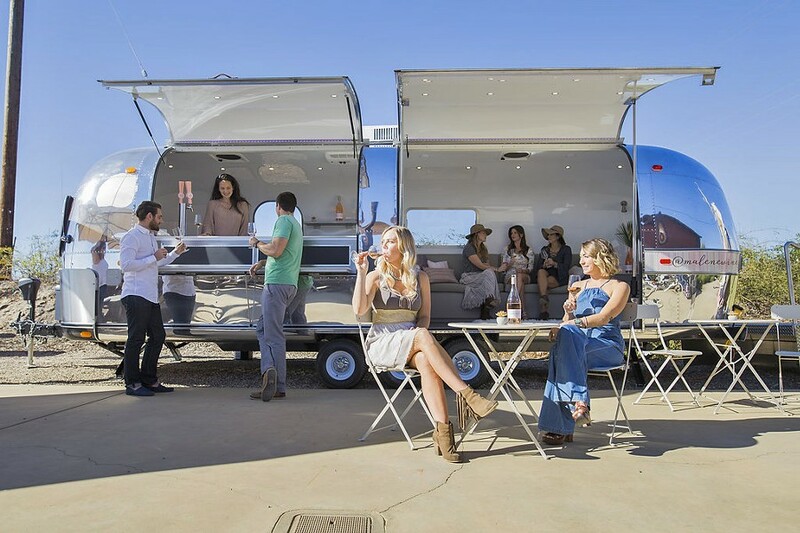 By design, you will not find a trace of earthy pinot noir or toasty chardonnay in this trailer (although you can get both at Chamisal, or any other neighboring winery). This one's for those who think pink and take that title seriously. Since June 1, rosé lovers have cozied up inside the new trailer (way roomier than you'd think, it fits about a dozen people). Eager to get their hands on more than one rosé at once, fans have been known to sprawl out on the lawn with a picnic, soaking up a new kind of SLO wine experience. Drip a little rosé on your white tee? No problem! Purple wine lips? Nope. Finally, a place for those who celebrate the lighter side of life! On this sunny afternoon, it's just me and Malene winemaker Fintan "Fin" du Fresne, who is currently donning a baby pink Malene logo tee. With so much work invested in the wine, the brand, and this mobile masterpiece, this project has nothing to do with "rosé all day" memes or the kind of sweet, "blush" abominations you'll find in mysterious boxes or jugs. For du Fresne, who you may already know as the winemaker for Chamisal and owner of Winery Mechanical Systems, the "p" in "pink" stands proudly for Provence. "Malene, at its heart, is a Californian spin on Provence. If you were to go to any winery in Provence, you will find that the wines are very rosé centric," du Fresne says. In addition to rosé, Malene makes a fine, refreshing vermentino (although the team prefer to call it by the French name, "rolle"). DRINK PINK Newly released Malene rosé wines are ready for summer sipping. Try the slightly bright, spicy, smooth-drinking old vine rosé of Grenache, on tap now in the Malene Scene Airstream. If you already adore rosé, you probably know about this magical land—a place where pink wines are not an afterthought, but a true discipline. The Provence region of southeastern France extends from the left bank of the lower Rhône River to the west, to the Italian border to the east, and is bordered by the Mediterranean Sea to the south. "The hardest part was spending so much time in Provence," du Fresne says with a laugh (he knows his life appears ridiculously dreamy, but I assure you, he's got dirt under his nails). "The research and development trips were fun, but surprisingly exhausting. We were visiting three to five wineries per day, meeting with winemakers, tasting a lot of rosé, with hours of driving between wineries. It was intense, but worth it." Plus, the winemaker says with an impish smile—in Provence, "You can always go to the beach and take a swim after a long day." When you think about it, this region of SLO isn't too far removed from that dream. The coast is nearby; the terroir exceptional; and, now, the interest for rosé has truly ripened. This was not so a decade ago, when du Fresne first got the idea to ramp up rosé. "There has always been this misconception in the U.S.; white wines and rosé are wines for beginners. People think they are showing that they are an expert because they only drink red wines. Well guess what? In the industry that shows that you are a novice, saying I don't drink whites," du Frense says. "Just about everywhere else in the world, rosé is not something winemakers really concentrate on, it's just something that they do. That is really what we were seeing until about 2015." Ah, 2015. The year the Malene label and its first vintage was born; the year rosé went "mainstream," on Instagram and across hip urban wine bar menus; the year young foodies and even old, stodgy wine critics began craning their necks to take a second whiff of the pink stuff. Dare I say this was the year subtle became the new bold? "I remember working at a winery in 2005: The owners were asking how much rosé they should bottle and I remember telling them to bottle a lot of rosé because it was going to be the next big thing," du Fresne says. "Well, I was about 10 years too early." Now, in 2018, this crisp and modern take on rosé is primed for its closeup on the Central Coast. More fresh, dry, low alcohol, acid driven rosés are popping up across the region, from Paso Robles to Santa Barbara. "The people who are seeking out rosé are wine savvy, and they skew young and female," du Frense says, adding that he has a theory that rosé-swilling men—to their credit—tend to be a bit more in touch with their feminine side. However, "easy drinking" does not mean "easy to make." Malene grapes are selected from Santa Barbara County with an eye toward making the best rosé (i.e. grapes picked specifically for these rosé wines; they are not leftovers that didn't make it into a bolder red). 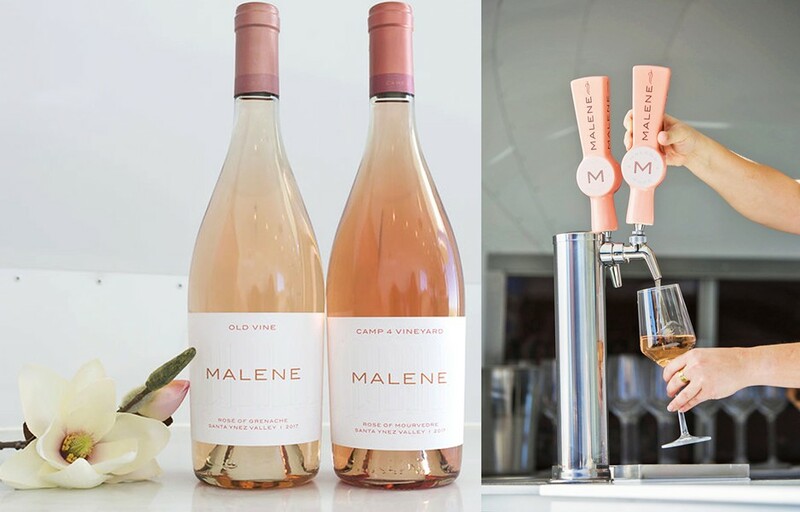 Sip the Malene lineup fresh from the tap, which includes a delightful 2017 flagship cuvée, plus a newly released Bandol-style rosé of mourvèdre, and a rosé of Grenache, made from 44-year-old vines. Each is its own lady: Flirty, mysterious, and spicy. "Rosé is difficult to make because it's got to be really good. Rosé is one of the most technical wines to make. If you turn your head on a rosé, it can go south. It oxidizes really easily; you can have too little, or too much color. It is a very transparent wine prone to issues," du Fresne says. "Its hard to get right." It's very good, then, that folks are waking up to the pink, and appreciating the very real work that goes into that breezy blush you'll soon be pairing with all your fish tacos, pastas, and grilled summer veggies. Hayley Thomas Cain takes rosé pretty seriously, but will still add ice cubes to her glass as needed. She can be reached at hthomas@newtimesslo.com.